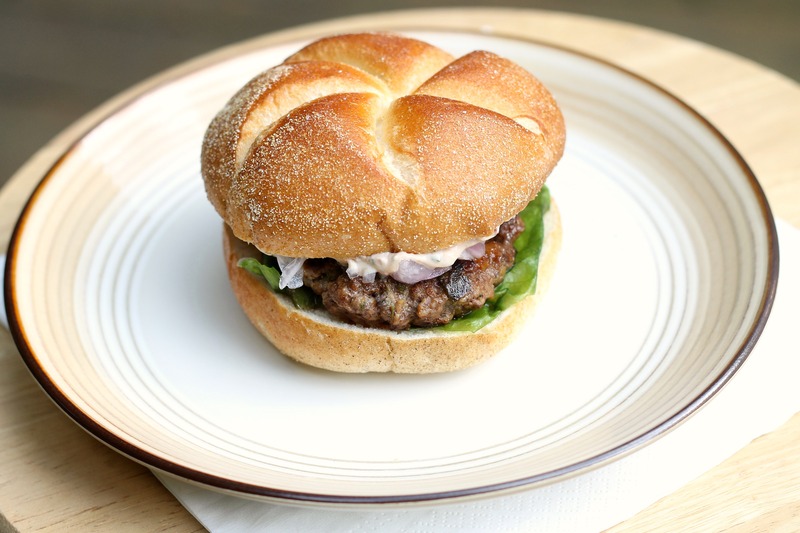 It’s about time that we put a burger recipe on our blog! Perfect time, too- just in time for summer grilling season. Despite what our blog might look like, we both appreciate a good burger now and then. If you are wondering, our favorite is a grilled burger topped with American cheese, caramelized onions, and bacon on a toasted bun. Heaven in a sandwich. This burger is definitely completely different from our favorite, but that is not a bad thing at all. Roasted poblano chiles are folder into your burger, which is made with low fat meat. Don’t worry, though- these burgers are not dry at all thanks to a bread-and-milk mixture that is added in. It’s a similar technique to meatballs. The burger is topped with a spicy, smoky chipotle cream sauce that is really easy to mix up. Then comes (almost) the best part- pickled onions. You might think that it’s an unnecessary step, but we think they really make the burger because their slight sweetness helps balance out all the spice. They are really easy to make- you just boil some vinegar, sugar, water, and jalapenos, stir in your onions, and that’s it! An easy and delicious topping that would be great on any burger. These burgers have made rounds on lots of blogs, and it’s easy to see why. They are unique and delicious! By the way, the title wasn’t kidding- these are spicy burgers (in our opinion). If you are adverse to spicy foods we would recommend reducing the poblanos and putting a little less adobo sauce in the chipotle cream. For the pickled onions: Combine the sugar, vinegar, water, and jalapeno in a medium saucepan. Bring this mixture to a boil, and stir until the sugar has dissolved. Add onions, remove from heat, and cover. Cool to room temperature, and store in the fridge until you are ready to use them. For the chipotle cream sauce: Combine 1 1/2 tablespoons cilantro, 1/4 teaspoon salt, 1/4 teaspoon pepper, the chopped chipotle chile and the adobo sauce, sour cream, shallots, and lime juice. For the burgers: Preheat your boil. Line a rimmed baking sheet with foil. Place your poblano chiles on the sheet and broil for about 8 minutes, turning after 6 minutes, until blackened. Either seal the foil around them or place in a sealed gallon-sized plastic bag for 15 minutes. Peel the chiles, remove the seeds and membranes, and chop them. Combine the bread and milk in a large bowl. Using a fork, mash it until it becomes a paste. Add the poblano chile, 1 1/2 tablespoons cilantro, cumin, coriander, paprika, 1/4 teaspoon salt, 1/4 teaspoon pepper, and beef. Mix it gently to combine. For 4 patties, making a nickel-sized indentation in the middle (this helps keep them flat). Grill or pan-fry for about 3 minutes per side, or until they are done to your liking. 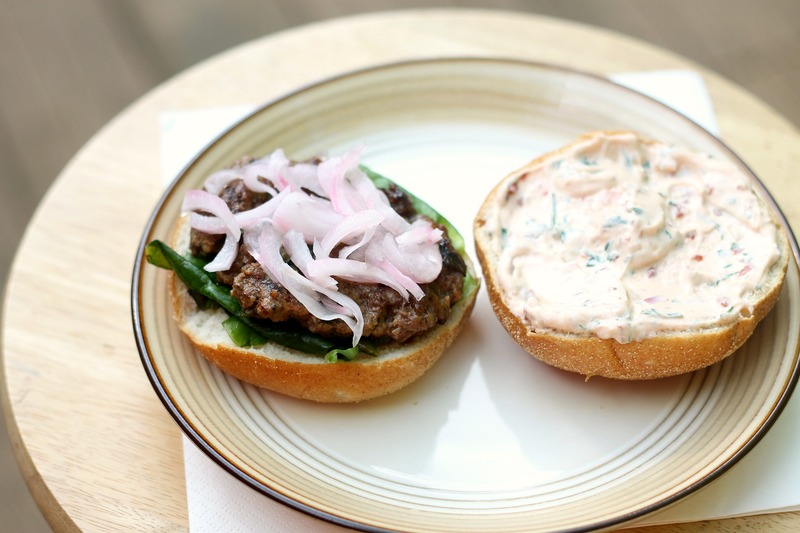 Serve the burgers on toasted buns with the chipotle cream sauce, pickled onions, and lettuce. Enjoy! Note: you will have extra pickled onions- they would be great on sandwiches and other burgers!